You have reached our 2011 Christmas gift ideas for couples blog however don't worry we have loads of great gift ideas for 2015! Head over to our Christmas Gift Ideas for Couples 2015 blog for some fantastic gift ideas for couples. It’s that time of year when we start stressing about what to give our loved ones for Christmas. If you’ve exhausted the chocolate and jewellery options, bought every accessory imaginable for their favorite hobby and don’t have a clue what to get your extended family then OutdoorNI.com can help. With OutdoorNI Gift Vouchers you can now buy unique and thrilling Christmas presents for your loved ones all from the comfort of your own home. With over 25 couples gift vouchers to choose from it won’t be long before you’re crossing off the names from the Christmas present list. Give your son-in-law a chance to have a laugh with his better half or buy a voucher for your brother and sister-in-law so they can enjoy some quality time together. They say the joy of the gift is in the giving not the receiving, but who says you can’t appreciate both?! Buy a couples voucher for your husband, wife, boyfriend or girlfriend and enjoy the experience with them – it’s a win win situation! See Strangford Lough like never before. Hold on to each other as the 12 seater RIB zooms over the lough visiting a whole host of stunning sites including seals, whirlpools, Audleys Castle and more! Peddle round the city together on comfy California cruiser bikes. Local guides will take you to places you never even knew existed and show you the sites on this fun and informative tour taking in over 20 points of interest. Find out who really is the better driver as you take it in turns behind the wheel on an off road driving experience. The adrenaline pumping action doesn’t stop there however as the experience also includes a zoom down a 500m Zip line and a heart racing white knuckle hill rally ride. Enjoy a romantic side by side paddle – if you can keep your balance that is! This Stand Up Paddleboarding (SUP) session is aimed at beginners and provides the perfect opportunity to try something completely different. Definitely a gift with a difference! Scale new heights together as you take part in Northern Ireland’s only tree top adventure course. After coming back to the ground on the exhilarating 200m zip line you’ll then blast down the hill together in a giant zorbing ball. Sail away together on the beautiful Antrim coast. With your very own skipper on board you can choose to learn the basics of sailing or simply sit back, relax and enjoy the view. The perfect mix of adrenaline pumping action and relaxation. Get strapped into a zorbing ball together and hurtle down the 300m hill at high speeds. After this it will be time to relax and enjoy each others company in the hot tub. An exhilarating combined rock and water activity sure to get your hearts racing. Encourage each other to take a leap of faith as you jump of cliffs and splash round the stunning coastline together. Enjoy a romantic date with a difference. Your guide will take you round the stunning Strangford Lough as you and your partner paddle in your very own kayak stopping off at a remote island for a bite to eat. A distinctly unique outdoor adventure! This hour long tour is a fantastic way to get out in the great outdoors and spend some quality time together. From the moment you step on the Segway you’re sure to have a smile on your face. This session is a great opportunity for any couple wanting to learn some off-road skills and develop their confidence to go moutainbiking together. Beautiful locations and great routes are guaranteed! The soon to be launched North Coast Sea Kayak Trail featured on BBC Countryfile on Sunday 27th November. 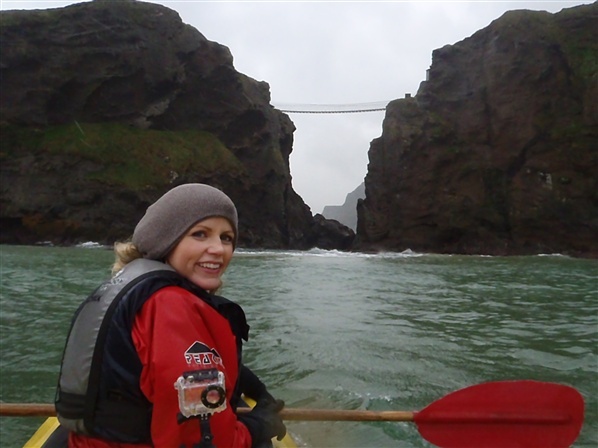 Despite some grim November weather, presenter Ellie Harrison enjoyed a great day paddling along the trail with Robin Ruddock from Ruddock Sea Kayaking and Canoeing. The Port Moon Bothy will be officially launched in March 2012 to coincide with the launch of the North Coast Sea Kayak Trail and will offer an open fire, composting toilet, lounge area, drying room and sleeping space for eight adults. The bothy will be managed and maintained by the Causeway Coast Kayak Association (CCKA). The CCKA hope to display some of their collection of historic kayaks in the rafters and artifacts from the salmon fishery on the walls to create a truly authentic atmosphere for all who use the bothy. Visit CanoeNI.com to find out more about the launch of the iconic North Coast Sea Kayak Trail and indeed the refurbishment project of this old cottage which is not planning on relieving its maritime heritage any time soon. You have reached our 2011 Christmas gift ideas for men blog however don't worry we have loads of great gift ideas for 2015! Head over to our Christmas Gift Ideas for Men 2015 blog for some fantastic ideas for your dad, husband, boyfriend or brother this Christmas. The decorations are up, the lights are being switched on and the giant tins of chocolates are out in full force at the supermarkets – it can only mean one thing – Christmas is upon us. If you’re dreading battling the crowds at the shops or are lacking inspiration for that perfect gift for your dad, husband, boyfriend or brother there’s no need to panic as OutdoorNI.com have over 90 gift experiences for him . 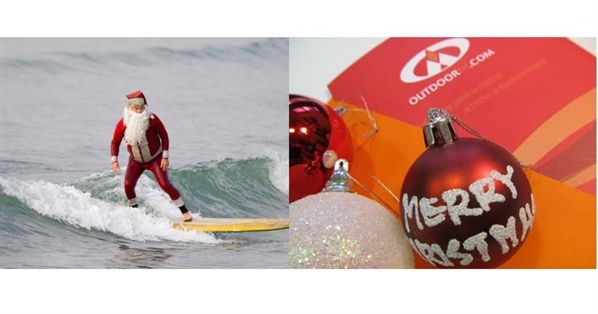 OutdoorNI Gift Vouchers mean you can now buy unique and thrilling Christmas presents for your loved ones and friends all from the comfort of your own home. Swap your grandad’s predictable present of socks for zip lines, get your dad off the net and surfing the waves, and feed your brother’s ‘Call of Duty’ obsession with a paintball combat session. Get ready to hang ten and hit the waves as you learn from the experts how to tackle the waves of the North Coast on a two hour surfing lesson. Experience archery like never before as you hit the balloon targets and try your hand at archery golf. With one and half hours of archery you’ll be ready to take on the man himself – Robin Hood before the day is out! Take to the water and make a splash with an adventurous morning or afternoon's paddle along the beautiful River Roe with Binevenagh as the background setting. Hurtle at high speed down a hill face inside a massive inflatable ball. This is one Christmas gift that isn’t for the fainthearted! Learn to fly a hovercraft and experience the thrill of blasting over land and water at speed before testing your coordination and nerve driving your very own Powerturn Buggy. Get your adrenaline pumping as you scramble, climb and dare to jump off cliffs into the Irish Sea! This unique and action packed activity takes place on the stunning Ballyhoran coastline and is sure to be an unforgettable experience. Release your inner Tarzan as you take on Northern Ireland's only tree top adventure course. The course comprises of over 40 challenging elements set at varying heights above the ground. You'll find yourself tackling fun obstacles such as rope bridges, scramble nets, zip wires, Tarzan swings, and a King Louis Descent Powerfan drop. Ready, aim, fire! This is the perfect present for anyone wanting to try Clay Pigeon Shooting for the first time. With 50 random sporting targets to blast out of the skies it is sure to get him excited. Learn the ropes of sailing with some hands on experience or simply relax and enjoy the scenic Antrim Coast. With room for up to three people so he can even take friends or family along too! Explore the underwater world with Aquaholics. Forget the Great Barrier Reef, try something completely new and discover a whole other side to the North Coast. The three hour session will include a safety briefing and instruction from a fully qualified PADI instructor. This course is the perfect introduction for anyone wanting to experience the thrills of kitesurfing. A truly unique activity this is a great taster to discover what it’s all about. Fully qualified instructors will be on hand at all times ensuring you have the ultimate experience. Experience the thrill of Urban Combat. With 8 dynamic game zones to choose from you certainly won’t be bored! Find out who your true friends are as you battle it out with over 440 paintballs each.